A new furry face is bringing a smile to patients and staff on the wards at the Royal United Hospital in Bath, thanks to the Pets As Therapy charity and their team of animal volunteers. Fudge the Cocker Spaniel is the new top dog in the RUH’s Pets as Therapy (PAT) team of animal volunteers. Her handler Carole Light said: “Like her name she’s a real sweetie – such a good little dog, really gentle and well-behaved, so I knew she’d make a perfect therapy dog. She lives in a family with seven children so nothing fazes her. “She’s been assessed to make sure the hospital environment would be appropriate for her, and her entire health history from her vets was also checked. Once the Pets as Therapy team approved her, I bought her a little yellow scarf to wear to show she’s official. “We’ve visited a few wards together and Fudge is already proving popular with staff and patients. One patient was really emotional when she gave her a bit of fuss as she missed her own dog at home so much, but seeing Fudge made her day. Pets As Therapy is a national charity which provides a visiting service in hospitals and a variety of other venues across the UK. 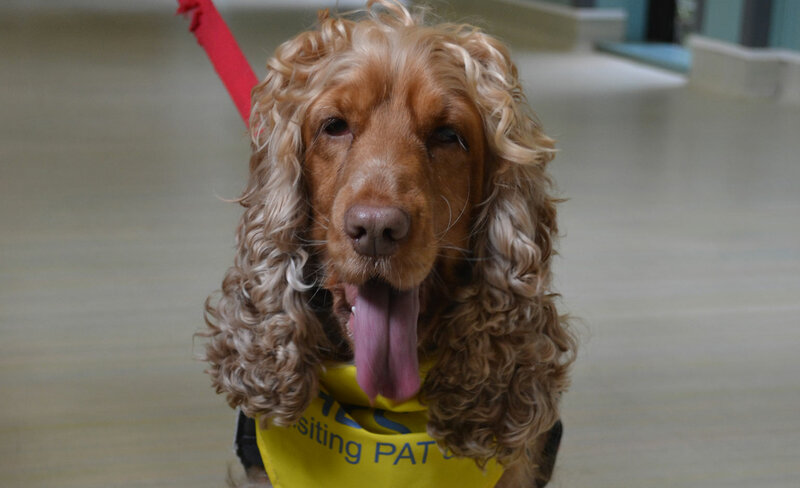 PAT dogs and their volunteer handlers visit patients at the RUH every week. For more information about the charity or to request an application form to join the PAT dog team, visit www.petsastherapy.org.